Before anyone try to correct me, thinking there is a typo in my title, let me clear it up front by saying that I was not referring to "Lamb Stew" hence the alleged typo of "Stewed" but rather I was referring to "Stewed Noodles". This is just like the common mistake with 姜母鸭 where it is 姜母 + 鸭 and not 姜 + 母鸭. 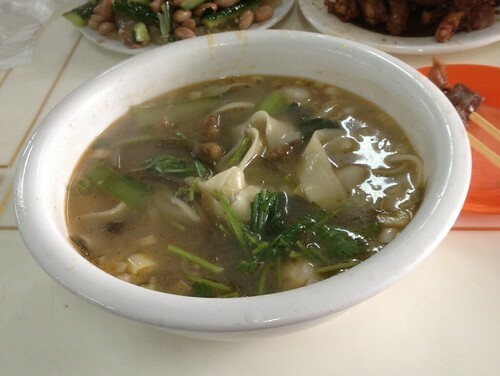 So anyway, this dish is called 湖南烩面, literally translates to Hunan Stewed Noodles. A check with a Hunan friend of mine about this dish garnered a blank look from her. Hmm..... perhaps while it originated from there, it wasn't as popular throughout the province? So anyway, I decided to name my blog entry title Lamb Stewed Noodles to be less confusing. The interesting thing about this gigantic bowl of noodles, measuring 30cm in diameter, is that there are only 2 strands of noodles. Yes. You heard me. 2 strands. This, by the way, is the small bowl order. The big bowl order has 3 strands of noodles. OK, the 2 strands, 3 strands thing was deliberately misleading as I failed to mention that a single strands is a mega long strand of noodle such that just 2 of these noodles is enough to fill up the bowl. Think the opposite of our Katong Laksa. Taste? Very tasty!! It almost like Mee Sop Kambing except that ours has a richer soup stock. Haha. The mutton is nice and tender with generous portions of leafy vegetables (which I am guessing Cai Xim), bean sprouts, coriander, garlic clove and spring onions. p.s. I notice noodle restaurants here do not serve spoons. It is like a Japanese ramen stall where you are supposed to lift up the entire bowl and drink the soup from the lip of the bowl. p.p.s. Maybe I should bring my Capital friends to Singapore to eat Katong Laksa and drive them all bonkers without chopsticks. Haha. skarli your Capital friends drink and eat Katong Laksa from the tip of the bowl, instead of using spoon, since they are more accustomed to chopsticks. Gary: Well in that case, I hope the laksa dribble all over their chins and down their shirts. Heh. Again, i reiterate that it is not a stew as the soup is rather thin ala consomme. I didn't exactly pull up the noodles to count "one... two..." but the noodle is damn bladdy long for sure. I didn't see the end of either noodle whenever I fish it out with the chopsticks until towards the end.